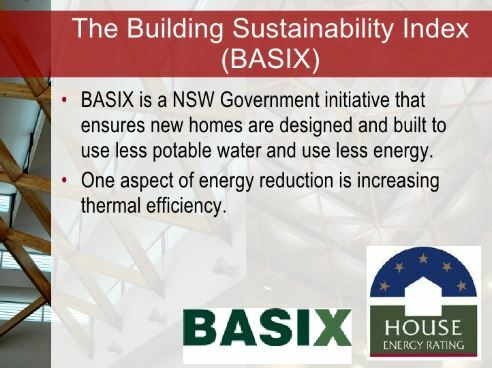 The Building Sustainability Index (BASIX) is a policy measure in Australia that aims at building homes that are more water efficient as well as more energy efficient by delivering lower greenhouse gas emissions. BASIX is one of the strongest sustainable planning measure to be implemented under the Environmental Planning and Assessment Act. It is now a requirement for any individual (human or company) to submit a BASIX certificate to the local council when developing a new home or undertaking renovations that cost at least $50,000. The BASIX certificate is only issued upon successfully completing the BASIX sustainability assessment. The tool works by analysing data relating primarily to the design of the proposed house and assesses this against energy and water benchmarks. If the proposed house design meets these specific benchmarks, then the BASIX certificate will be issued. The BASIX assessment tool can be obtained on the BASIX website; the website requires you to create a BASIX account to apply. Our main focus here will be hot water systems. For this particular piece we will closely observe how the mode of operation has a bearing on the BASIX score. Instantaneous (continuous flow) systems heat water only when required and as such do not require storage tanks. This is done through a system through which the heating mechanism is activated once the tap is turned on. A short delay typically occurs in delivering hot water as about 2 litres pass through the instantaneous hot water system. Storage systems function by first heating the water within an insulated storage tank (which also functions as a storage tank) then disbursing the water as pre-heated. Through heat loss mechanisms such as conduction and convection these systems typically lose heat (and energy) to the surrounding environment. Since the instantaneous system only generates heat when needed, it is usually more efficient than its counterpart storage system. However, through an inefficient (or possibly damaged) heating system, the instantaneous system may end consuming more energy especially if used frequently. So it is important for you to identify an efficient system so as to obtain a high BASIX score for energy assessment. When it comes to storage systems, energy losses come about through transfer of energy between matter that is in physical contact. In such underground water tanks, the main methods through which heat transfer occurs are convection as well as conduction. Convection is the transfer of heat through liquids or gases in the form of currents; in this particular case it would be the transfer of heat through the water in the tank. Conduction, on the other hand, is the transfer of heat from one solid to another. In this case it would be the transfer of heat from the plastic of the tank to the soil particles in the ground. The amount of heat disbursed by the material in question is determined by the conductivity of the material: – this is a measure of how easily the material conducts heat. Generally, metals have higher conductivity factors as compare to plastics. This is why you would probably install a plastic water tank. Plastics are generally known as insulators. These are materials that generally retain heat and as such are best suited for making products that require heat retention. There are other factors that may affect the tank’s insulating properties such as the thickness of the tank as well as the quality of the plastic. Since you’re storing water you can’t do much about its conductivity. It’s required by law for any individual in the New South Wales (NSW) to obtain a BASIX certificate to build any dwelling. Remember, the BASIX assessment requires you to pass certain targets to get approval. A poor water storage design may be the difference between you getting your application rejected and coming out of the BASIX assessment with a BASIX certificate. Consequently, it may be worthwhile for you to obtain a reliable, good quality underground water tank. How far into the ground should you place your water tank? ← Previous Previous post: Why choose a custom car detail and car polish in Adelaide? Next → Next post: Types of marble tile: How are they different?